Relax with us on Lake of the Woods, Canada. Fishing, Bear Hunting, and Whitetail Deer Hunting are some of the species we provide guiding for. With Paul & Chris Batiuk as your Kenora Fishing Guides, you and your party will be escorted around the maze of islands on Lake of the Woods for superb walleye fishing, smallmouth bass fishing, trophy muskie fishing and giant lake trout fishing. Batiuk and Son Guiding and Outfitting Service is a family owned guiding service, situated in Kenora, Ontario on the north shore of Lake of the Woods. Dedicated to customer service and quality guided experience. With having over 40 years of guiding experience (including 11 years working for the 3M Company guiding corporate clients, where only the highest standards of customer service was expected) we will ensure you will have a memorable trip. In our 40 years of guiding, we have successfully guided all fresh water species of fish, and big game species offered in in Northwestern Ontario, both in archery and rifle. We will also treat you and your party at lunch time to one of the finest shorelunch dinners that you will find in North Western Ontario. Fresh Walleye fillets, golden brown fries, baked tinned beans, bread etc. 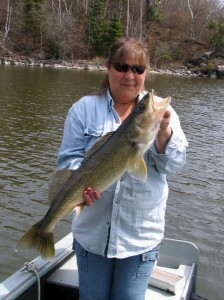 After seeing all the sights and sounds of Kenora – spend a day with us on Lake of the Woods in the fresh air sight seeing, catching a lot of fish, and seeing North Western Ontario at it’s best with a fishing guide. Kenora awaits.